Frequently Asked Questions at your Lyons Community Library! What books do you have available for book clubs? How do I download an e-book from the Lyons Regional Library? 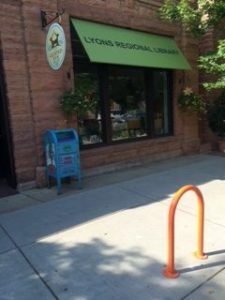 How do I Volunteer for the Lyons Regional Library? Does the library have free WIFI and a computer I can use? What if the library does not have the item I need? How can I donate books and other items to the Library? Where can I return library items after hours? Can I return books from other public libraries? How is the Lyons Regional Library District funded? Will a new or larger library be built in Lyons? What about the Mill Levy? How do I look at old versions of this website? To see a complete list of books that we carry in abundance for book clubs, click HERE. Volunteers are appreciated at Lyons Regional Library! If you are interested in volunteering please contact the staff at info@LyonsRegionalLibrary.com. Please read the Volunteer Policy before volunteering. Click on this link HERE to have all your questions answered. Or come on into the library with your device and we’ll help you get started! Absolutely! 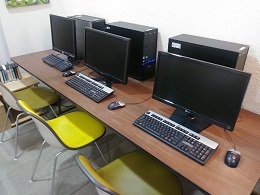 Use your own tech device to access our wifi, or we have several Windows PCs and Macintosh public computers for your use. No library card required. We also have a printer. Black and white copies are ten cents each and color copies are 50 cents each. Please pay at the circulation desk in the front. Library staff is also happy to show you how to scan items. We do not have a fax available. The Lyons Regional Library has access to over a million books and materials through AspenCat. The catalog of available materials can be found on the Books and More page. To place a hold, enter your User ID (your 14-digit library card number). Your password is your last name, lower case. The library will notify you, usually by email, when the materials arrive at the library if they are being borrowing from another participating library. Questions? Stop by the library, and let us walk you through this step-by-step, or use one of public computers to search and place a hold. If you still cannot find the item you are looking for, come in and request it. We are capable of getting items from libraries all around the state of Colorado, although the process will take a little bit of extra time to get to you. How can I donate books and other items to the Lyons Regional Library? You can still support the library with your other donations, however! Simply take your books to the Bookworm in Boulder and ask the credit for the sales to be applied to the “Lyons Regional Library.” Money from the sales of those materials will be used to purchase materials for your library. Our dropbox is a blue mailbox near the front door of the Library at 405 Main Street in downtown Lyons. Can I return books and materials from other public libraries? Yes. We belong to a consortium of other libraries called AspenCat. If you borrow a book from within this system (and almost all of our books are from within this system) we can return it and track it through our courier system. It’s a type of InterLibrary Loan. The date it is returned to the Lyons Regional Library is the date that it is returned. It is not dated by when it arrives at its home library but by the date that it is returned to us at Lyons Regional Library. If you check materials out from a non-AspenCat Library (such as Boulder or Longmont) we will return it for you through our courier. We’ve had great success with this but because the systems are different we can’t track them as expertly as we can within our own system. It’s rare that books and materials are lost but it happens and usually libraries are very understanding! Please don’t hesitate to return materials to us. How is the Lyons Regional Library funded? The Lyons Regional Library District is funded by property taxes paid by residents in the Lyons Regional Library District, as approved in a 2014 election. Property taxes are the sole responsibility of county Assessor’s office. The Lyons Regional Library District Foundation accepts grants and donations as part of a capital campaign to add features to the planned new library/resource center. The Lyons Regional Library District Foundation has been established and approved by the IRS as a 501(c)(3) organization to accept tax-deductible contributions to the new library. Contributions may be sent to: Lyons Regional Library District Foundation, PO Box 2505, Lyons, CO 80540. The process continues for the Lyons Regional Library District to create a larger library/resource center with flexible space for our community. Library operations at our Main St. location will continue while our new building is being planned and constructed. The library invites you to check The New Library Progress page for updates. Also be sure to check this website, local papers, and other outlets for news & opportunities to become involved. Or call the Library at 303-823-5165. A Mill Levy is the “tax rate” that is applied to the assessed value of a property. One mill is one dollar per $1,000 dollars of assessed value. Library operations, including required reserves, are funded by the mill levy. Our District mill levy rate of 5.85 mills is based on property values set by Boulder and Larimer County Assessor’s Offices. Property taxes are the sole responsibility of county Assessor’s office. The Library District does not set these values. The District is not asking for a mill levy rate increase to fund the new community library building. Other Districts, such as school and fire, also use mill levy. If you are curious to find out how much you paid towards the Library District you can call the Boulder or Larimer County Assessor’s office and ask. You can also visit the Assessor’s Office websites. Look for the Mill Levy Breakouts for your address. The Lyons Regional Library will be its own line item.